We just had this for dinner and we loved it! It definitely satisfied that pizza craving. I like this better than any of the Keto crust recipes. Thanks, so happy to hear you liked it! I am confused? You had to scroll past the recipe to write this comment. Where there is some large text in green is where the recipe starts. I made this last night and it was a hit! I used thighs instead of breast because my husband doesn’t like chicken breasts. It was delicious! So glad you enjoyed it! I like the idea of using thighs! OMG. This looks and sounds delish! What do you serve it with? Just a salad, or a gluten free pasta? Thanks! Any kind of green salad or green vegetable would be great if you want this be low-carb. Do you have the calorie count on this? Going by the ingredients getting a crazy high count. Sure it’s low carb, but that doesn’t mean much when 1 serving is as big as the count was showing. Here is the calorie count from Yummly, which may or may not be accurate. I’m not able to calculate nutritional information for the recipes for several reason, including the additional time it takes, the difficulty in doing it accurately, and the sheer number of recipes on my site. If you look after the recipe itself, I give two links (where it says “Nutritional Information”) for suggestions of two ways to get that information. That’s all I can do at this time. This was delicious! Some things I did differently were I sliced the chicken breasts in half lengthwise so they were 1/2 the original thickness. I found I didn’t need to use the Mallet on them then. I also used a garlic salt blend as well as fresh grated parmesan and the oregano. I added in cooked bacon crumbles over the partially cooked chicken before adding the sauce (Mrs. RAO’S homemade pizza sauce 13 oz. but only 12 carbs in whole jar). I then added mushrooms and waited to put the cheese on until it had cooked a full 20 minutes. It was scrumptious. I love how you adapted it. Sounds like I need to look for that pizza sauce too! Glad you enjoyed! I don't calculate nutritional information for a variety of reasons but if you look after the recipe where it says "Nutritional Information" there are two links for ways you can get it. Can I use Alfredo sauce? It has significantly less carbs? To me that seems like a completely different dish, but I can't imagine why it wouldn't be good. I'd love to hear how it turns out! Crystal, glad to hear you enjoyed it! I was very intrigued when I saw the absolutely gorgeous photo you used for the pizza and had to read. We make homemade pizza at home all the time, even though I make my own crust and it is not a low-carb recipe but always thoroughly enjoy other people's thoughts on recipes because I always seem to learn something new from other people's take on a recipe.it was a nice surprise to see that you experimented with the sauce because we are constantly experimenting trying to get everything right and the sauce is one of the harder things to get right because (like you said) it is always usually on the thin side.Thanks for the tip! 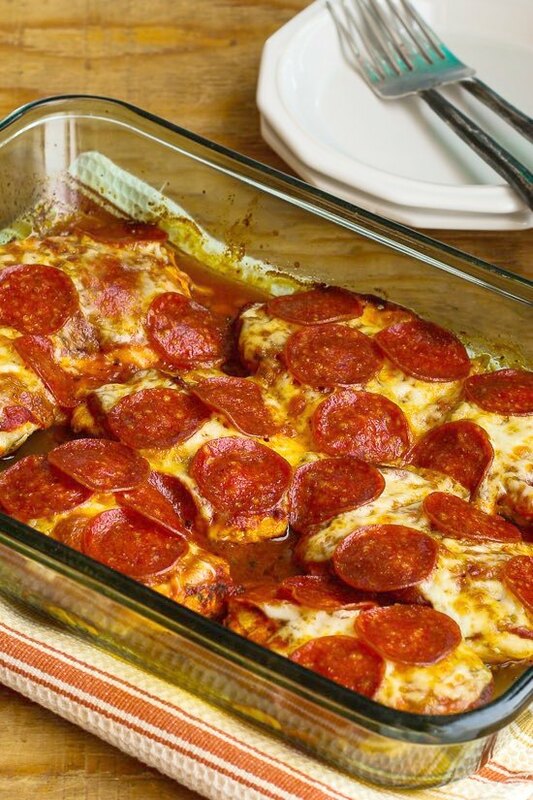 I don't know if you'd need to simmer the sauce if you used it on pizza with bread dough, but for this recipe the sauce is not going to absorb into the chicken! This has become a staple in our keto household. 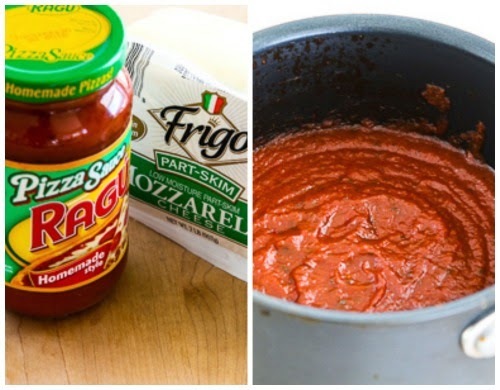 I use Rao's Pizza Sauce and don't bother with browning it first (just cook it a little longer) and we love it. So glad you've been enjoying it! I am cooking this tomorrow sounds nice . What could i serve it with ? Pick a healthy vegetable and enter it into the search bar and you will find lots of ideas. This was FANTASTIC! Here's how I did it…. Pounded chicken, placed in greased pan added a bunch of seasonings like pepper, parm. truffle rub, salt pepper, layered with moz/parm cheese, added spaghetti sauce, onions, mushrooms, tomatoes then a bit more cheese. Baked at 400 for 25 mins then covered with foil for about 10 mins on the counter. WE ALL L O V E D it, thank you!!! I'm a bit confused as the link to the pizza sauce has sugar in it, plus uses canned tomato sauce & paste, which I'm sure uses sugar. Is the link wrong? Yes, I must not have noticed that they added sugar to their sauce, so sorry about that. The one I used is pretty low in sugar per serving; I would probably just buy it. But I'll look and see if I can find a make-your-own sauce that's better. I wonder if they changed it, that is usually not something I'd miss! Oh now I see what happened. My link says "You can make your own sauce and omit the sugar." Of course there's some sugar in the tomato sauce and paste, but all tomatoes have some natural sugar. Here's a sauce from Atkins that is probably about as low in carbs as it can get; I think I will change my links to this one. Sorry about the confusion. I guess I am confused about how reducing could make the sauce thinner? How long did you cook it. Did you start with 14 oz. sauce and cook until you only had 8 oz? That would have to make the sauce thicker. We're trying to reduce carbs at our house, but we love pizza. Hubby really wanted me to try this recipe. I followed the recipe the first time, and we liked it. But I wanted a "faster, easier, fewer pans dirtied" recipe. So the second time, I skipped the pre-browning in the skillet. I used chicken tenders and didn't bother to pound them out. I just put them in a single layer in the baking dish, then sprinkled with kosher salt and cracked black pepper (we thought the chicken needed more seasoning) and topped with pasta sauce rather than pizza sauce. (I also skipped the step of reducing the sauce.) I baked it uncovered at 350F for about 20 minutes, removed the pan, and spooned most of the liquid from the pan. Then I added the mozzarella and pepperoni slices; increased the temperature to 400F and baked for 25 minutes longer. Husband loved it! As I said, we liked the original recipe, but a one pan dinner without messing up the cooktop by pre-browing the chicken worked much better for me. Glad you liked it, and glad you were able to adapt it to a version that fits your preferences better too! Kayla you are a genius! I've been searching for a paleo pizza crust that tastes good for a long time… just use meat! Brilliant!! I'm thinking a huge turkey breast pounded out would make a cool whole pizza too…. what do you think? So glad you like it! Turkey might work, but don't make it too thin or it will dry out in the oven. I might use more sauce for turkey! Hi, Kalyn! Love your site and enjoy your delicious low-carb recipes. I'm making this tonight; it's been on my menu "wish list", but I just can't seem to get past your amazing "Very Greek Grilled Chicken"! By now this is a family favorite. We don't eat very much beef or pork, mostly chicken, and the low carb options are tricky since some of my family are what I'd call "choosy" (aka picky!). This sounds like a winner and I can't wait to try it. Thank you, Kalyn! Kalyn, I made this last night, and all I can say is DELICIOUS!!! My whole family loved this dish, and I had dinner on the table in 45 minutes from start to finish. All I added to the menu was a tossed salad, and everyone was happy! This is in my "keeper" file for sure! Thanks so much! Thanks Juli, so glad everyone liked it! Do you think this would work using shredded mozzarella? It will work, but not as well in my opinion. I used sliced mozzarella so it would stay together more on top of the chicken. I think the shredded mozzarella will run down to the bottom of the dish a lot more. But probably still tasty! I'm making this for the 2nd time tonight. We use turkey pepperoni. It is a keeper. Thanks! Melissa, so glad you are enjoying it! I would like to assemble this in a (sprayed) disposable pan a day ahead for a family member recovering from surgery. Do you foresee any problems with that? Thanks in advance! Looks delicious. I wonder a bit about how sitting in the fridge will affect the flavor of the chicken. Possibly this Deconstructed Pizza Casserole would be better for making ahead and cooking later. But I don't know for sure, would love to hear how it works for either one if you try it. Is it possible to use thighs for this?? Haven't made it that way, but I'm guessing it would work. I worry a bit about the difference in thickness, even if the thighs are cut open and spread out there are some thinner parts. Love to hear how it works if you try it. After entering in the calorie count I was disappointed in the Fats and Sodium but I'm thinking it was not calculated correctly. However it was good. And I used No salt added everything, homemade the sauce. Glad you liked the recipe. I just follow carb-conscious eating but don't calculate things, so I don't know whether it would be right or not; I think those things are pretty hard to calculate accurately. If you look immediately after the recipe where it says "Nutritional Information" there's a link where you can copy and paste the recipe and it will calculate it. Or if you're a member of Yummly, just use the YUM button at the top to save the recipe and it will give you the nutritional info. Where did you purchase your pepperoni? I want to purchase delicious pepperoni. I just got pepperoni at my regular grocery store. I think I used Hormal brand. That sounds good to me Doreane! I might pre-cook the peppers so the dish doesn't get watery. I find it hard to recommend menu combinations because everyone likes different things, but I'd love this with a roasted green vegetable like green beans or broccoli. You could cook it in the same oven. Any ideas for sides other than a salad or spaghetti? For those whose diet includes some fresh fruit, our meal included a fresh fruit salad. It says in the recipe you can make your own pizza sauce if you want less sugar. And if you use the sauce I did, the sauce still has 18 carbs after it's reduced, divided by 6 or 8 servings, that is 2.5 or 3 carbs per serving for the sauce. Not much else has carbs except a little in the cheese so I still feel this is low-carb. Delicious recipe, will make again soon! Thank you! So glad you liked it; thanks for letting me know! Finally got around to making this!! Didn't have the recipe pulled up, so I was improvising. Was cooking just for me, so I used 2 large and one small chicken breasts, which I didn't cut up. Used a packet of pizza sauce I had left from a pizza crust kit I didn't use before expiration of the crust. Always looking to add more veggies, so I put browned chicken in the baking dish, topped with a smidge of the cheese (to work as "glue,") and then put a layer of spinach/creminis/garlic that had been cooked in a non-stick pan. Then layered reduced sauce, remainder of mozz, pepperoni and a sprinkle of parm. It had been a bad week at work (I didn't get to eat this until almost 10 that night! ), and this was the perfect comfort food. Served it with some spaghetti squash that I had previously cooked in the slow cooker… took half a squash and simmered it with a cup of low sugar marinara while the chicken was in the oven. Eating round one of the leftovers while I type this, and it is sooooooo good. Thanks, Kalyn! This one is definitely a keeper!! Thanks CJ, so glad you enjoyed it! Love hearing how you improvised. Such a great idea! And looks so tasty! Thank you for the idea! Can't wait to try this out. How were the leftovers? The leftovers were great. When I'm by my computer. I need to edit! What a great idea Kalyn – I don't think anyone would miss the crust! What a fun idea! Really, who needs pizza crust with so many great flavors going on in this dish? Thanks Lydia. My favorite part is the cheese and the pepperoni, so I'm good with this. Looks amazing Kalyn, I can't wait to try it! Thanks Mike, so glad you like it! And Happy New Year to you too. This reminds me of the chicken do-dads Dominos has been doing. I've been curious why they don't have a classic pizza option… Love this recipe/idea! Can't wait to make at home! CJ, haven't seen that from Dominos, but I'm sure there are endless variations of this idea. Hope you enjoy! What a brilliant solution to the no-carb pizza dilemma! Thanks so much, Kalyn & Jake. As a confirmed carb lover, I can tell I wouldn't even miss them in this meal! Thanks Pam; I will take that as a real vote of confidence! If you need that info there is a link after the recipe to Calorie Count where you can calculate it. Honestly (we are doing low carbs first three months of year) this was INSANELY delicious and we'll make it every ten days for the foreseeable future.. I'm going to add black olives under cheese next time for more pizza goodness… added you on Pinterest.. great stuff! Thanks Greg; so glad you liked it. Love the idea of adding olives!